It's Sunday morning. Maybe you've overslept, maybe you haven't. Maybe you are rejoicing in the Lord, maybe you aren't. Without a doubt, there is never enough time to get to church with everyone fully dressed and in their right minds. Kids are cranky. Kids are hungry. Kids can't find their shoes, belts or Bibles. Parents are cranky. Parents are caffeine deprived. Parents can't find their outfit, keys or wallet. Breakfast needs preparation and consumption. Hairs need combed and teeth need brushed. Shoes need tied. Jackets need put on. Kids need buckled in carseats. Kids yelling at kids. Parents yelling at kids. Parents yelling at parents. No one has any sense of urgency except for maybe you-the mother. The closer those clock hands move towards church time, the closer you come to insanity. Once everyone is in the car and the car is moving towards church, there is no sigh of relief. Your attitude is so unholy and un-sanctified, you may as well turn the car around and go home. 'Cause there is no worship gonna happen in your heart this morning. Sound familiar? Sound like a little bit of hell every week? No wonder the 18-35 year old bracket isn't in church. They have the young kids. -Plan backwards. The time you need to be at church is pretty constant from week to week, as is your travel time. So, work backwards from church time. If you need to be at church at 9:30, and it takes 20 minutes to drive there, you must leave by 9:10-at the latest. Keep working backwards, figuring in time to eat, get dressed, shower...whatever needs to happen on your Sunday mornings. -Take showers and baths night before. 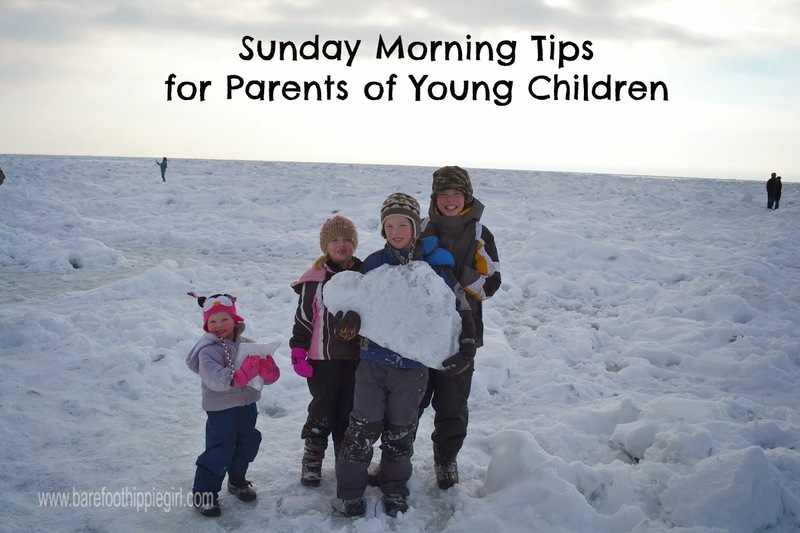 I am a morning shower person, so I still shower on Sunday mornings, but we never give the kids baths on Sunday morning. It takes too much time. That time is easier on the Saturday schedule than on the Sunday morning schedule. -Set clothes out the night before. Kids clothes. Your clothes. This saves last minute "what should I wear?" issues, as well as puts the finding of lost articles of clothing in a different time frame. Everything is set out-shoes, pants, shirts, ties, belts, socks, tights, dresses. Much easier. And easier for kids to dress themselves. -Bibles stacked the night before. It is just easier. One less thing to do/find on Sunday morning. -Plan and make a simple breakfast. Maybe Sundays will be your cold cereal morning. Maybe you will make a pot of oatmeal for everyone. Maybe you will have muffins or toast. Simple is the goal. Full bellies allow for concentration and relieve crankiness. -Get up early enough. It is so easy to hit the snooze. Sunday mornings-especially in the summer-are our only days to sleep in. Every other day we are up early to exercise and work and do school. I think our Sunday morning tiredness is an attack from the enemy of our souls. He does not want us in church fellowshipping with other believers and worshipping God. -Go to bed early enough. This is intrinsically tied in with the ability to get up early enough. It is hard to be eager to get up at 7:00, when you didn't get to bed until 11, or 12, or 1. Make a decent bedtime hour on Saturday night a priority for your family. -Do what you can before Sunday morning. Do the least you possibly can on Sunday morning. Don't spend pre-church time cooking or cleaning up. Ironing or whatever. Do it before Sunday, or make it wait until another time. -Delegate. You don't have to do everything. Give responsibilities that are age appropriate. Sometimes I have my 11 year old make the oatmeal for the breakfast while I am in the shower. I have Mr. Hippie give the kids a visual once over, so they are at least relatively presentable. -Get dressed then eat. I had someone tell me to feed my kids and then get them dressed so they didn't mess up their clothes. But what was happening was that the kids fooled around so much with their breakfast (and still didn't get done) and we were hollering for them to finish so we could get them dressed and leave in 5 minutes. It made it so.very.stressful. Instead, we now get the kids up and dressed including shoes, but not jackets, and then feed them. The ones who need to, wear a bib. And, when it is time to leave, at least they are dressed and have had the opportunity to eat something. What are your best tips for smooth Sunday mornings?